Old Palace Lane is arguably Richmond’s most historic street. Many of the changes and developments that have made Richmond what it is today are reflected in this quiet little lane leading down to the Thames. 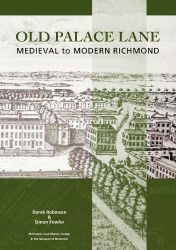 Old Palace Lane: Medieval to Modern Richmond, which opened at the Museum of Richmond on 6 May and continues until September, tells the story of the Lane, the people who have lived there, and its buildings. The museum is open from 11am Tuesdays to Saturdays and admission is free. The exhibition is accompanied by a book by Derek Robinson and Simon Fowler, published jointly with the Museum. Illustrated in colour, it is available at the Museum or from our online bookshop. This entry was posted on 6 May 2017 by Robert Smith.